An American company, despite the Oriental-sounding name, Sumiko has been known for many years as a purveyor of high-end cartridges at typically slightly less than high-end prices. The Blackbird is very much in that tradition with a specification that wouldn't look out of place in a dearer cartridge. The most obvious feature that marks it out as high end, however, is the construction, which with its complete lack of body and protection fairly screams 'enthusiast product'. It's all been done for a reason, of course. The ills of a resonant outer body on a cartridge have been a topic of audiophile conversation since at least the mid-1980s, when enthusiasts used to fill cartridge bodies with resin. Amazingly, some of them still worked afterwards. Sumiko is not the only maker to have dispensed with such fripperies as body and stylus guard, but this is one of the more extreme examples we've seen, with the ultra-fine winding wires brought out to terminations which it is hard not to touch when handling the cartridge. It's cleverly done, though, keeping the fragile wires on the inside of the assembly. We managed to install and remove this cartridge several times over the course of the review without doing any harm. An elliptical stylus is mounted on a boron cantilever which drives a moving-coil generator, but in this case it's a high-output type which can be connected to a moving magnet input directly, dispensing with extra electrical gain or a transformer. There's no magic in this. It simply requires the use of more turns, using thinner wire, compared with a normal low-output type and, as a result, the impedance of the cartridge is higher than normal at 135 ohms. Sumiko points out that this will, with typical electronics, give the best possible signal-to-noise performance, ensuring that any noise you hear is the irreducible minimum made by the disc itself. That apart, specifications are nothing out of the ordinary, with middling compliance and medium-high mass. Our abiding impression of this cartridge is of an unusually clean and pure treble and upper midrange. One might even think, with some LPs, that the balance is well on the laidback side, but any disc with plenty of lively treble will soon blow that idea away. In fact, we'd say that tonal balance is particularly well judged, but there's something about the way it's presented that makes it less intrusive than it can sometimes be. 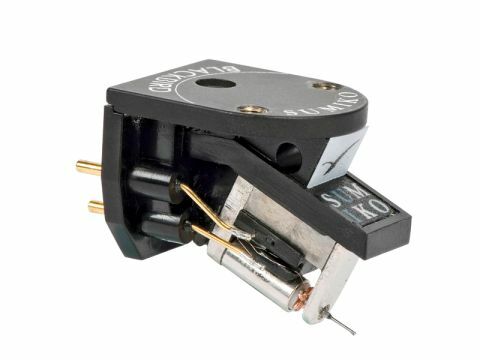 If you think (as some do) that moving-coil cartridges tend to sound a little bright, even aggressive, this cartridge could be the one that both proves you right and yet in itself provides the exception to the rule. Probably because of that, we found ourselves leaning towards well-recorded classical discs when looking for the next track in our more casual listening sessions with this cartridge. It can sometimes seem a little too polite with rock discs, although it does present all the information efficiently, even enthusiastically. It also has pretty good bass, well extended and controlled, though we wouldn't mind just a little more tunefulness to it. Attack and timing are again good, but not outstanding. We should mention that we had an unusually awkward time finding the ideal setup for the cartridge, as it has a tendency for the front to hit the LP surface if tracking force is high (unless the arm base is unrealistically raised). That's a pity, because there were signs that the bass and attack were going in a useful direction just before this happened. Even so, it is an impressive performer and offers characteristics.